The Facility Location On This Page Not What You're Looking For? The enclosed trailers on this page feature our selection from the McGregor, Texas manufacturing facility. This is ideal for customers in the Texas area near Dallas, Fort Worth, Austin, San Antonio and the surrounding region. If you've landed on this page but are not close to the McGregor, TX area, please shop our enclosed trailer selections from additional locations in Georgia, Indiana, or Oregon. White is our standard color for enclosed cargo trailers in McGregor, TX, but you may choose from a variety of other cargo trailer colors for an additional small fee. Choose single axle or tandem axle for the enclosed trailer size you want. Click the appropriate button to see a list of available options and trailer prices for the trailer size that you need. 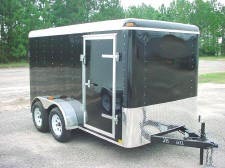 If you don't see the enclosed trailer size you need, call or email us! We can usually custom build to your specifications! For the customization of your concession trailer please select your preferred trailer size from the choices listed above and then choose your concession options from either the short list of options on the trailer page, or choose from a list of more than 400 options on our extensive Master Options Page. Please Note: If you are a Texas resident pick up at the manufacturing facility isn't currently available. Texas residents must have their trailers shipped to them. We can assist you in locating and coordinating with a reputable freight company.